This was the highest I have ever cycled in Switzerland. The posh Swiss ski resort of Verbier has hosted three Tour de Suisse “mountain-top” finishes in the past decade (’05, ’08,’14), and also a Tour de France stage in 2009. But the real cycling fun is above town. 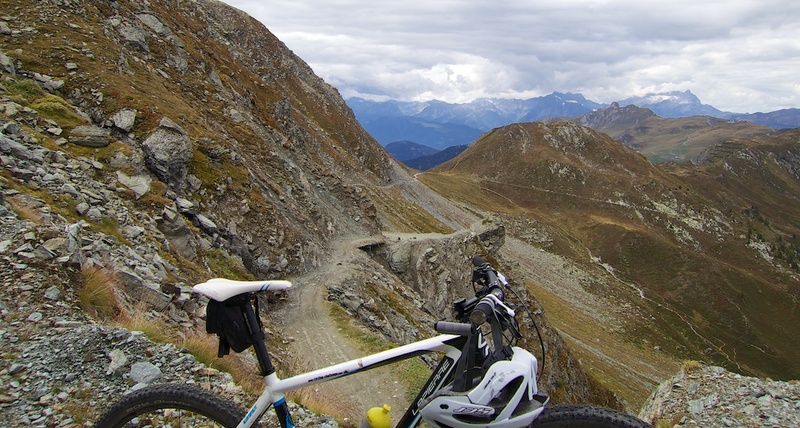 This ride gets more than a vertical kilometre above Verbier on some beautiful unpaved roads. But let me split this post into two parts: paved and unpaved. 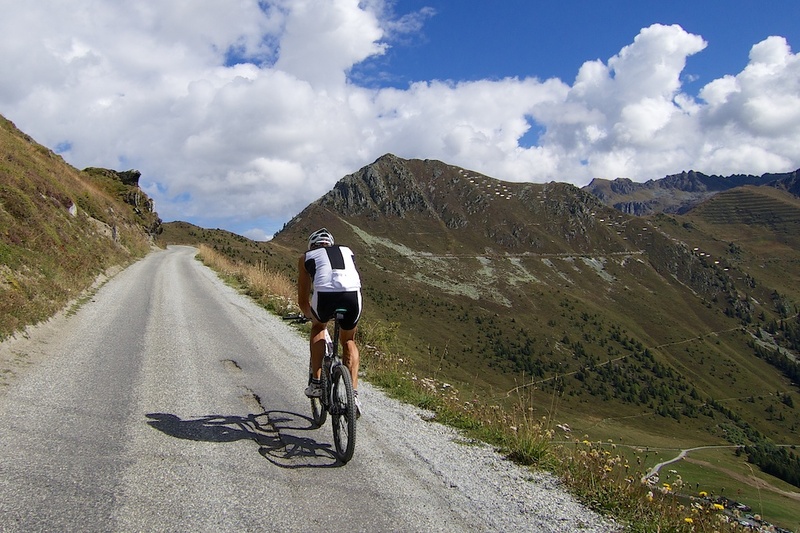 Road bikers can climb to Verbier like the pros did, and then add 6.5 steep kilometres to Croix de Coeur. At 2173 metres, wikipedia has it as the 16th steepest paved road in Switzerland. Excitingly, the top two kilometres were gravel, but have recently been paved. 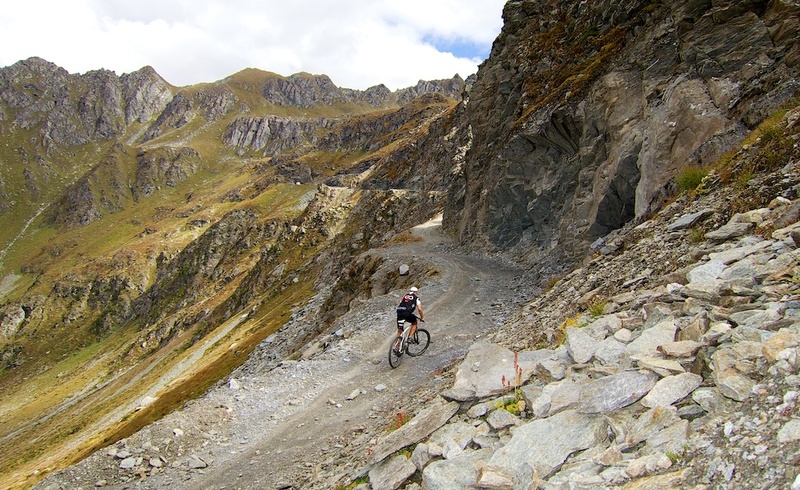 This extension to Croix de Coeur transforms a good climb to Verbier into a great climb. The profile at right is only for this paved climb to Croix de Coeur. One can also reach Croix de Couer from the far side, a gigantic 22km, 1700 metre ascent from the floor of the Valais through La Tzoumaz ski station. Details here. 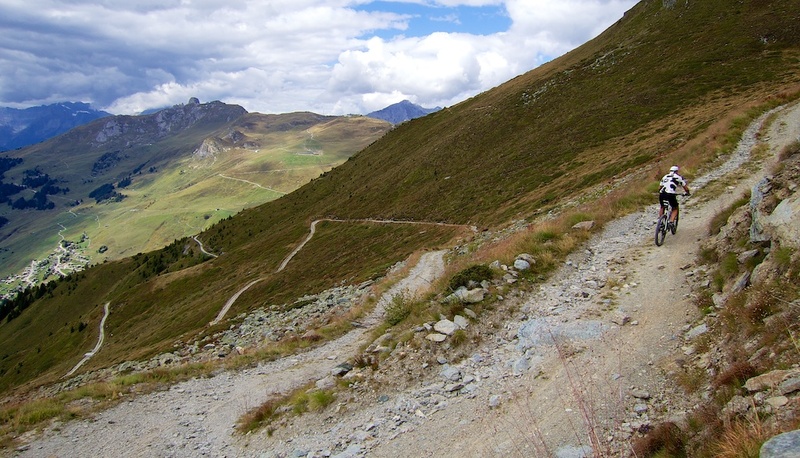 After a few kilometres there is an old, old road that heads higher to Col des Mines. I wasn’t sure it was ride-able ….. but it was. In the early 1800’s a deposit of 60% lead / 40% silver was found here. 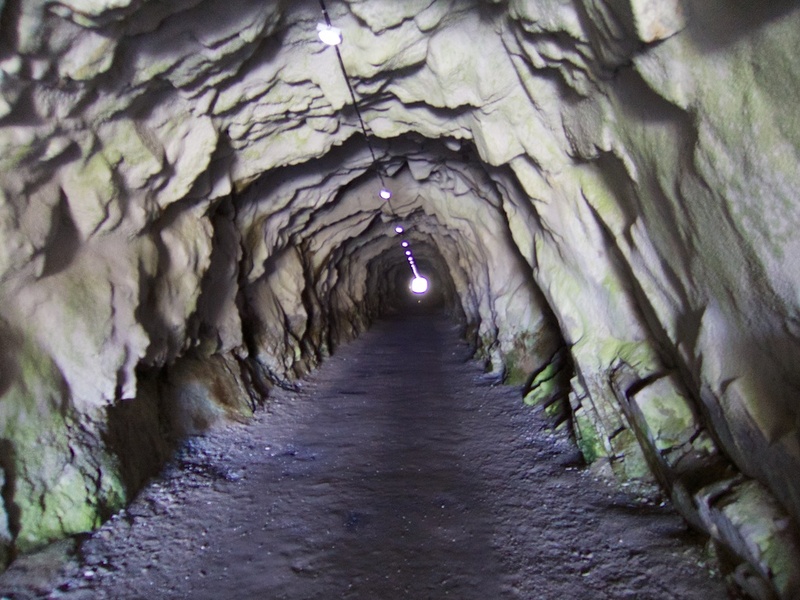 It was exhausted in 1861, but the name Col des Mines remains. It is a slightly crazy road, but fun. After a while the “road” turns up into the mountains and for a stretch I couldn’t pedal, but had to carry the bike higher along trails. Not too far though. Eventually, I reached the Lacs des Vaux. Three small lakes that (I think) share the same name. It is basically a high ski “bowl” with ski runs and a couple of chair lifts ending above. At this point I was hoping to make the ride into a loop, so I kept following the ski piste service road up. To get back over the mountains, though, my only choice was to push a little up a ski slope. But first I detoured to Col de Chassoure, at 2739 metres, this was the highest point I had ever reached in Switzerland on bike. It’s roughly 240 vertical metres higher than the highest paved road. It’s at the top of a ski lift. From here I was back on the flattish ridge road and could follow it all the way back to Croix de Coeur, and back to Verbier. This is an astonishingly fun route high up in the Swiss Alps. Thanks for that. Yes, I was imagining there were more fun routes here. 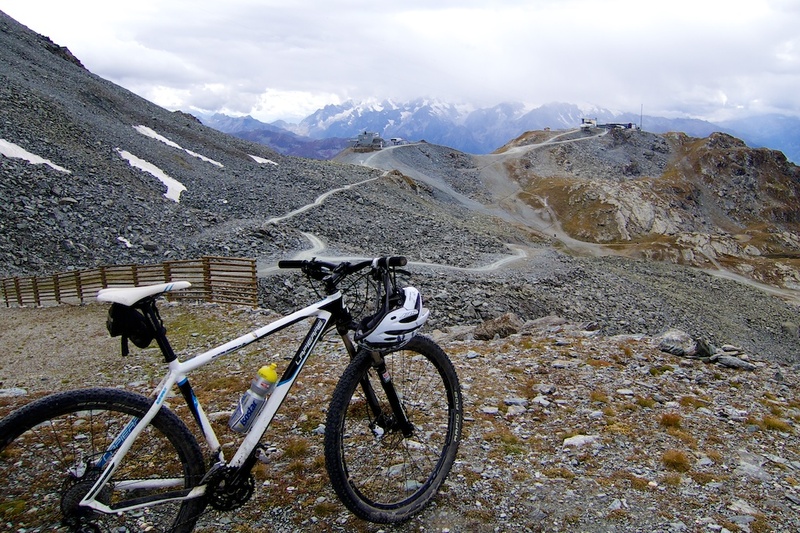 I was actually not that organised and just had a peek at Col des Mines and stumbled onto a great ride. Hopefull, I can try your route next year. Thx.